One of the things I’ve been doing lately is looking at the predictions of decor trends for 2017. 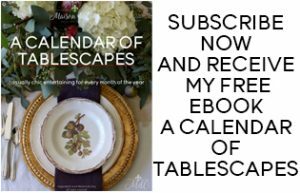 And though I don’t follow trends religiously, it is interesting to know what is coming up and also, it’s a great way to find ways to freshen up our interiors. After several years of all grey rooms and a sea of neutrals, we are headed for color! Can you believe it? And not just any color. Apparently brighter colors are the ones we’ll be seeing more of! This “pop of color” trend will be all about cobalt blue, bright greens, mustard yellows and hot pinks! Lucky for me (phew! ), white doesn’t seem to be going anywhere. But where there is white, there is a pop of color. And this I can get behind! For as much as I love white, I do like there to be a balance, and I think a little bit of color fills that bill. It keeps predominantly white or neutral rooms from going too cold, adds interest, and especially now in the winter, it really adds some much needed oomph! I’ve always loved a neutral room with some color, and in fact I wrote a post on it last year here, but in that case, I was referring to softer, more muted colors. In 2017, we’re talking brights! 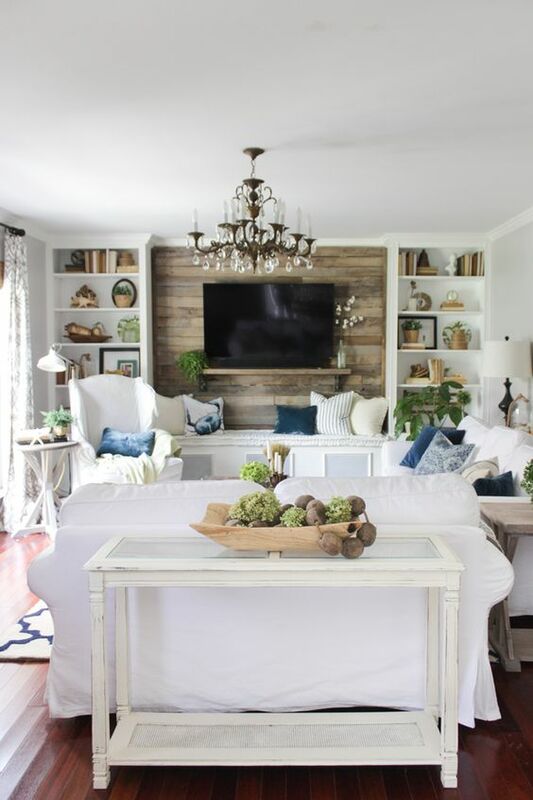 I may not change my entire rooms to brights or deep, jewel-toned colors, but I think a little color in a neutral or white room can be gorgeous. For me, the operative word is little. 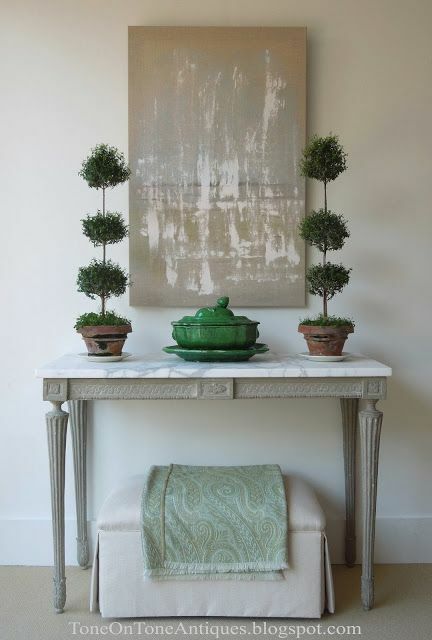 Love this vignette featuring the deep green vintage tureen. By Loi Thai of Tone on Tone. 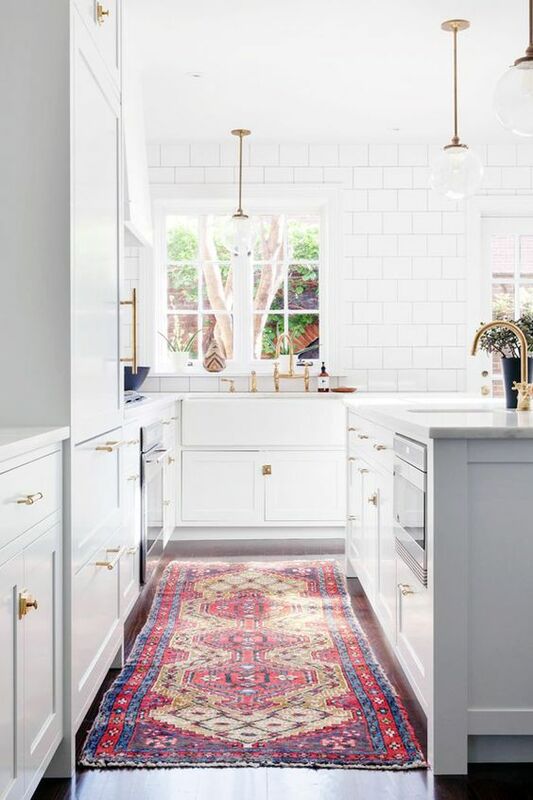 Love this all-white kitchen with just the antique kilim to add a punch of color. Stunning! Design by Chanee Vijay. 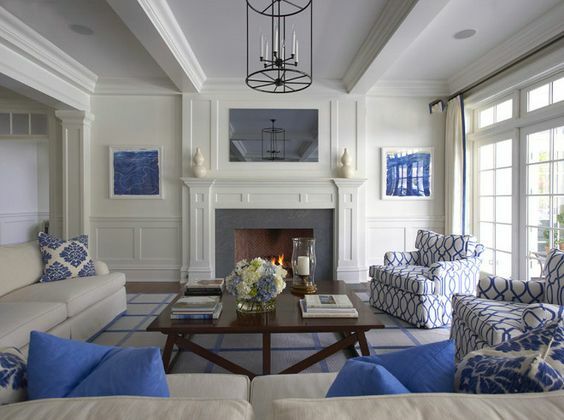 Farmhouse, but with that touch of cobalt to brighten things up. 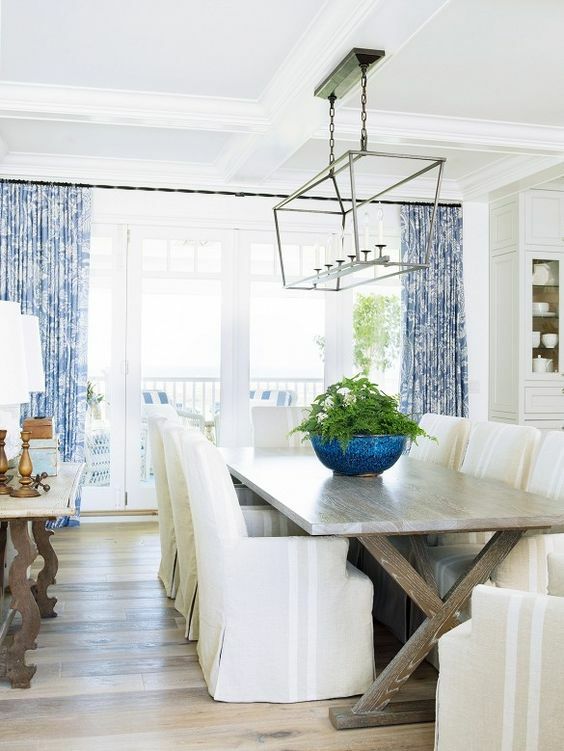 From Shades of Blue Interiors blog. Love the punch those pillows give this otherwise elegant and monochrome room. Via House Beautiful. Adore these pops of green against all that white! Evars and Anderson Interior Design. 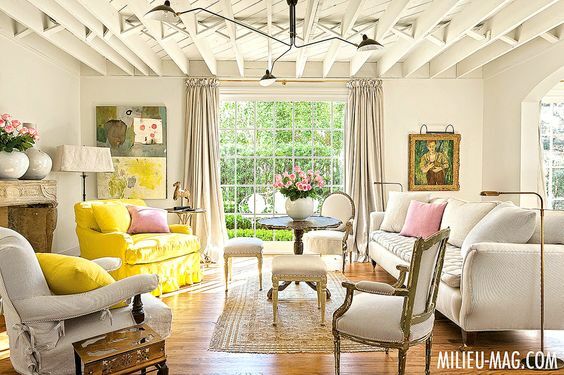 Love this room with it’s unusual pops of bright yellow! 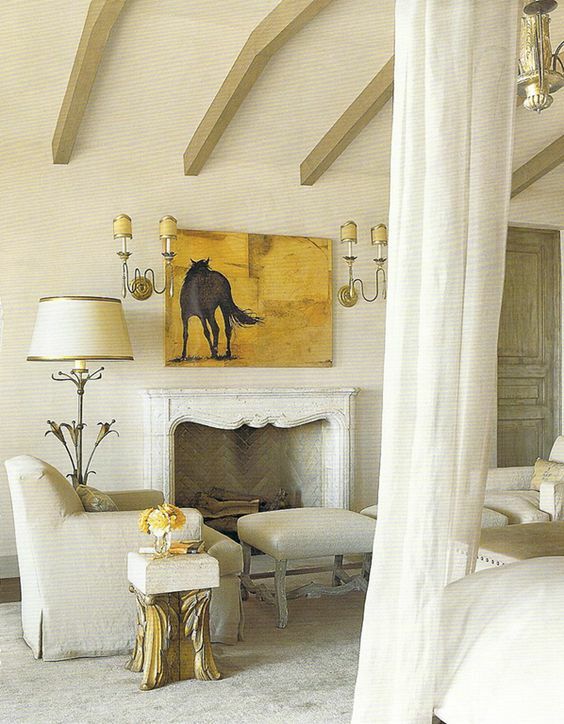 Shannon Bowers Design via Milieu magazine. This one has been a favorite for a long time. 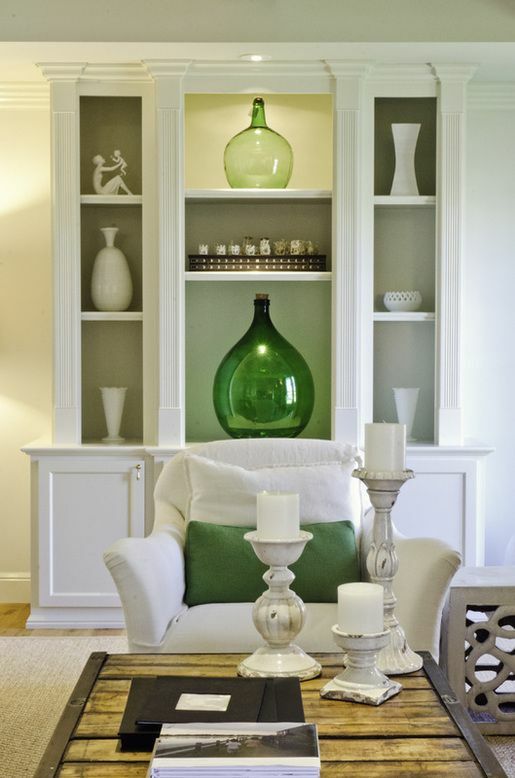 They could so easily have just gone with boring neutral pillows, but the deep greens really add spark. Sarah Richardson Design. 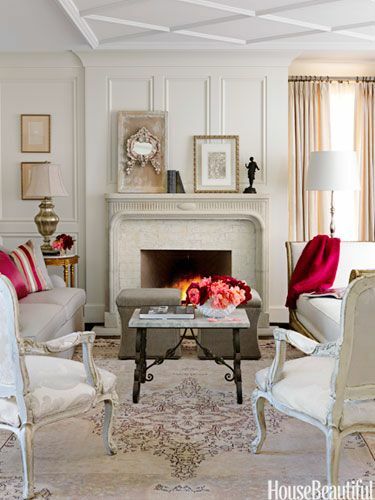 This photo exemplifies how even the smallest pop of color can totally change the room! 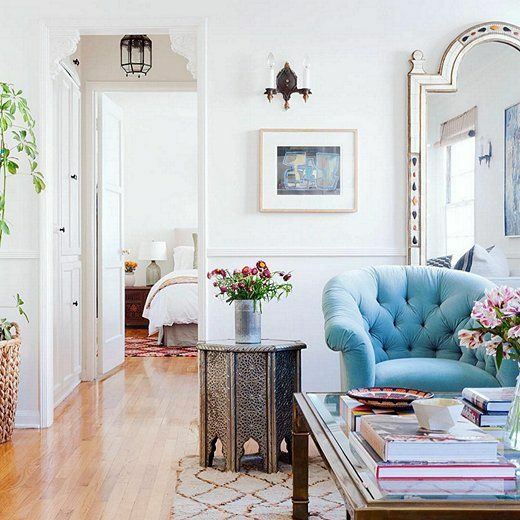 If you shy away from brights, and even pillows are too much for you, try a bowl, or a vase, or even bright flowers. 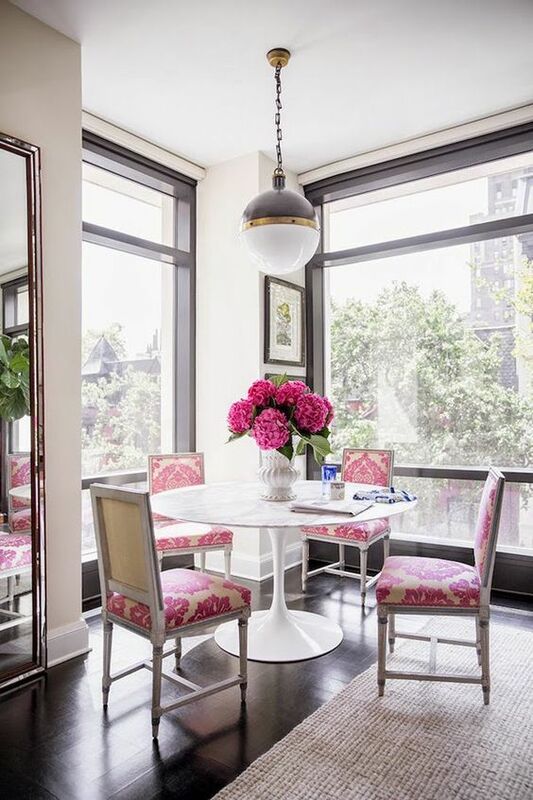 Adorable hot pink chairs! Design by Nick Olsen via Domino magazine. 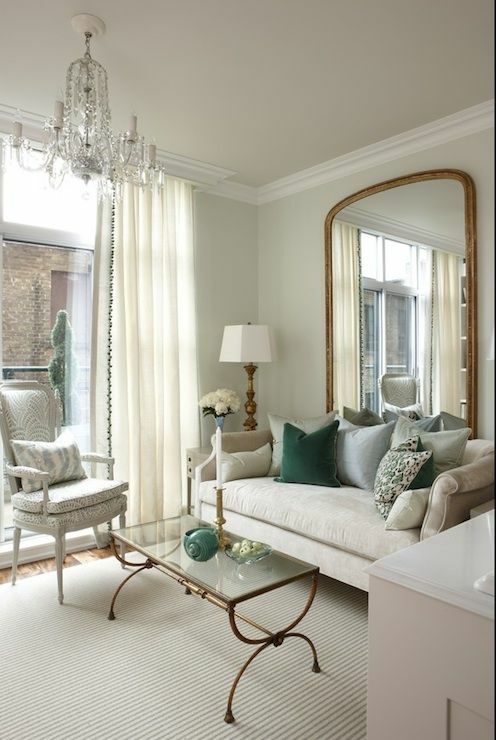 Katie Hodges Design via One King’s Lane. 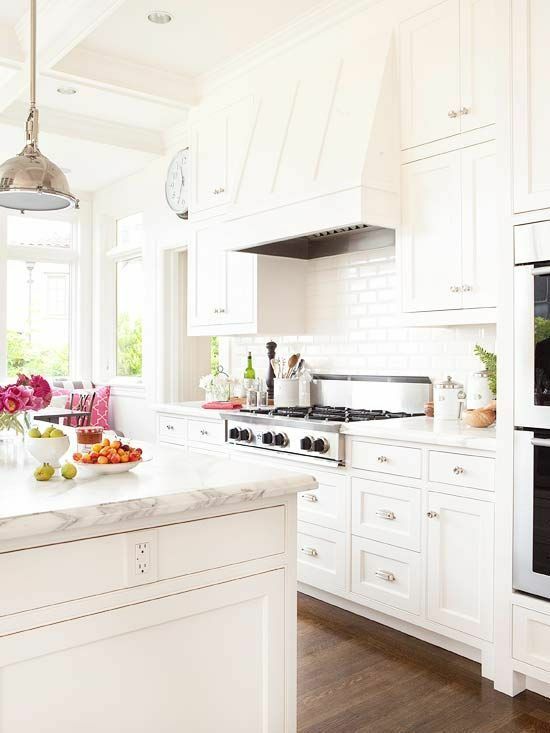 Another all-white kitchen with pops of hot pink! And again, even the flowers add to the effect! Via Better Homes and Gardens. This yellow painting really adds interest to an otherwise very monochrome space. 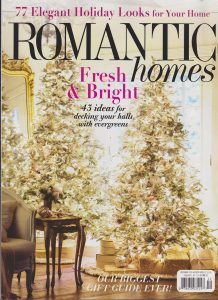 Designed by Brooke Giannetti via Veranda magazine. 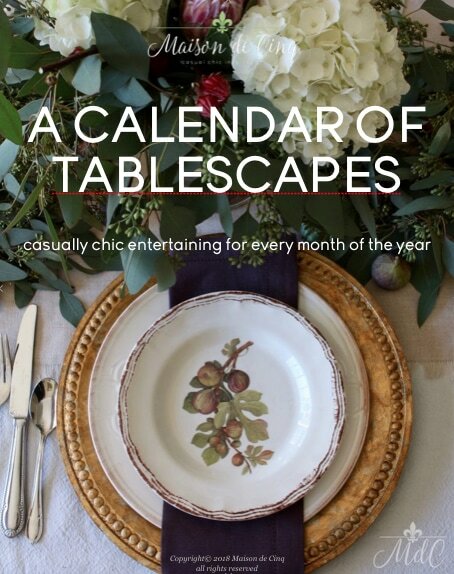 Via Suzanne Kasler via Veranda magazine. 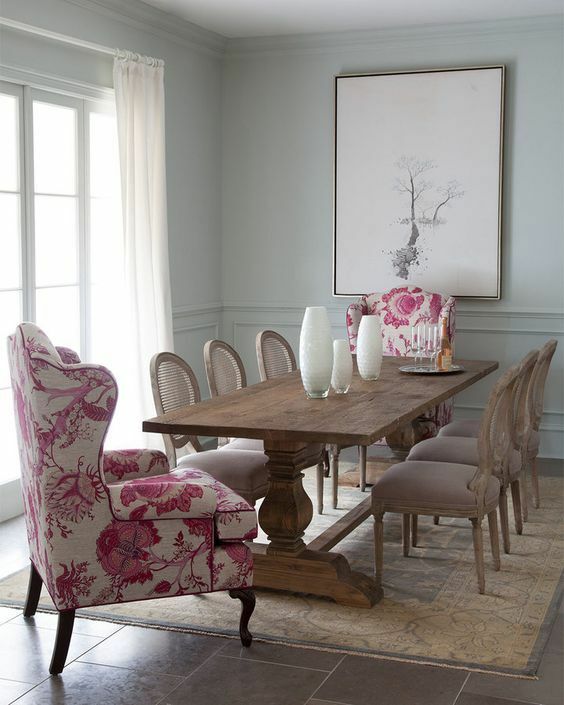 Here, they only used two chairs in this fun pink print, but it adds just enough punch! Via Horchow catalog. Yes, I so agree! You and I are the same in that regard. I love the cheery pop it gives, especially in the winter when we need it! Thanks for stopping by Karen! And Happy New Year to you and your family! I love each of these examples of small splashes of colors. Excellent examples. I agree, this is the way to use color, no saturated rooms of color for me! Thanks so much Jamie! And thank you for stopping by and commenting – I so appreciate it!! White is always so perfect for making it possible to add a pop of trendy color. Thank you for all this beautiful inspiration Sheila. Happy Friday!